A 53-year-old man with a history of alcoholism since 10 years admitted for jaundice elsewhere developed bilateral simultaneous decrease in vision in both the eyes 4 days after admission. His best-corrected visual acuity was 20/20 in both eyes. Visual field evaluation revealed an inferior altitudinal defect in both the eyes. Optic disc appearance, visual fields, and optical coherence tomography of discs were suggestive of nonarteritic anterior ischemic optic neuropathy (NAION) in both the eyes. Liver function tests revealed elevated serum bilirubin and hepatic enzymes. He was negative for hepatitis B virus (HBV) and hepatitis C virus (HCV) infection. Abdominal ultrasound revealed no focal hepatic lesion, and carotid doppler revealed no arteriosclerosis. A diagnosis of bilateral ischemic optic neuropathy associated with alcoholic hepatitis was made. Bilateral simultaneous NAION has been previously reported in perioperative visual loss, HCV infection, and interferon treatment. This is the first case report of bilateral simultaneous NAION in alcoholic hepatitis in the absence of associated infective viral hepatitis. We explore the pathophysiology of ischemic optic neuropathy in liver disease. An early intervention to correct the risk factors leading to NAION may help in preventing this vision-threatening complication in patients with chronic liver disease. Anterior ischemic optic neuropathy represents an acute ischemic disorder of the optic nerve head supplied by the posterior ciliary artery. It is divided into arteritic and nonarteritic anterior ischemic optic neuropathy. Whereas arteritic ischemic optic neuropathy is due to giant cell arteritis, nonarteritic anterior ischemic optic neuropathy is a multifactorial disease, with many risk factors like hypertension, diabetes mellitus, and hypercholesterolemia collectively contributing to its development. Bilateral NAION has been associated with primary hepatitis C infection, , interferon treatment for hepatitis C, ,, and perioperative visual loss (PVL), which is a very rare and unpredictable complication after spine or cardiac procedures. We report a case of bilateral simultaneous NAION in a patient with alcoholic liver disease without coexistent viral hepatitis. A 53-year-old man reported to us with a history of sudden bilateral decrease in the inferior field of vision, starting 4 days after admission in a hospital for jaundice and severe gastritis. He had been diagnosed with alcoholic liver disease. He was a known hypertensive, alcoholic, and smoker for 10 years. His systemic blood pressure at admission had been normal and stable with treatment as per the hospital records. Blood investigations showed deranged liver function tests, whereas hemogram was within normal limits [Table 1] and [Table 2]. He was seronegative for hepatitis B and C.
He had been treated symptomatically with injection pantoprazole 40 mg twice daily (bd), syrup cimetidine two teaspoons (tsp) thrice daily (tds), syrup Liv 52 two tsp tds with tablet Hepatogard (herbal medicines used in liver diseases, manufactured by Himalaya Healthcare and Themis Pharma, repectively) tds, injection ondansetron one ampoule intravenous (IV), tablet ursodeoxycholic acid one bd, tablet chlordiazepoxide 10 mg once in the morning and twice at night, and multivitamin and iron capsules one tablet a day. Ursodeoxycholic acid and Hepatogard were continued for 60 days and multivitamins for 30 days after discharge. He was on tablet amlodipine 2.5 mg/day for systemic hypertension. Patient had presented to us 3 months after the development of NAION. On ophthalmic examination, his best-corrected visual acuity in both eyes was 20/20. Pupils were reacting to light in both the eyes. 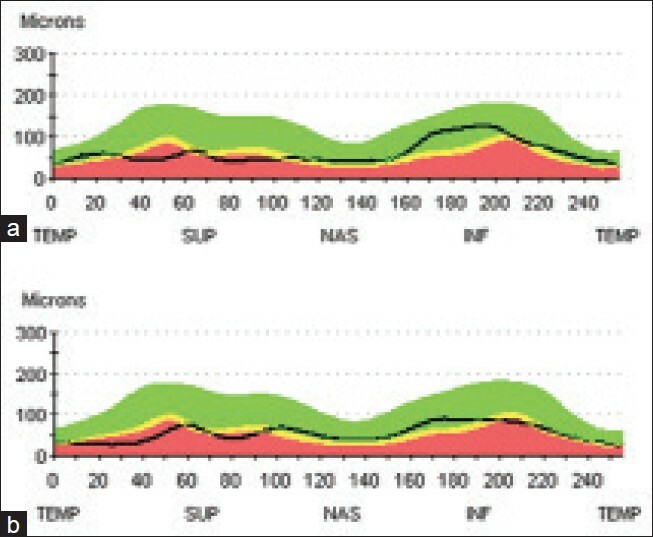 Color vision was normal by Ishihara test plates. Anterior segment and intraocular pressure were normal. 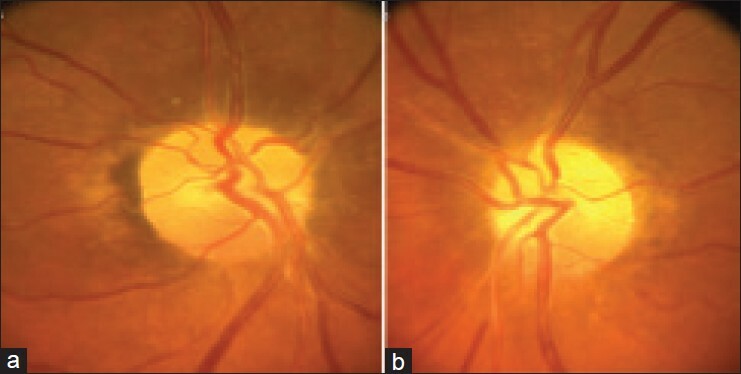 Fundus examination showed superior disc pallor in both eyes with inferior luxury perfusion [Figure 1]a and b. 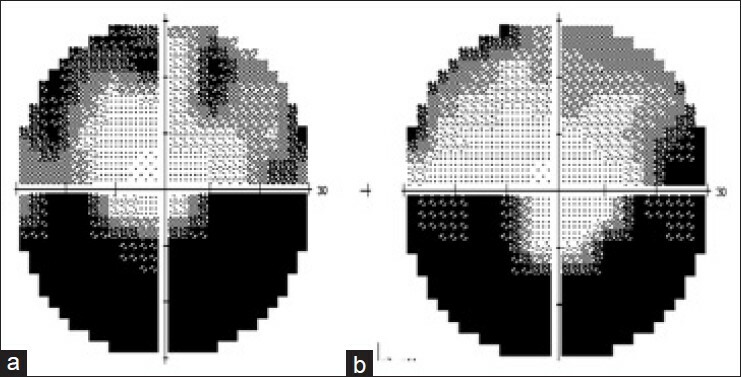 Visual fields showed inferior altitudinal defects in both eyes (OU) [Figure 2]a and b. Optical coherence tomography of disc and macula showed OU loss of neuroretinal rim fibers [Figure 3]a and b and normal macula. Systemic evaluation revealed a blood pressure of 130/80 mmHg. The patient had a hepatomegaly of 3 mm below the costal margin. Computed tomography of brain and carotid doppler was within normal limits. Our patient had typical risk factors for NAION like hypertension and crowded discs. Recent literature search revealed that advanced liver disease is associated with changes in the systemic hemodynamics like arterial hypotension, hypovolemia, decreased peripheral resistance,  and also alteration in the coagulation profile. Possibly, hypotension and hypovolemia associated with liver disease can lead to a bilateral NAION in patients with other coexisting risk factors. Hypercoagulable events occur in cirrhosis patients despite the well-known bleeding diathesis of liver disease. , We could not get the coagulation profile of the patient, but it is a known risk factor for NAION. Hence, bilateral ischemic optic neuropathy can occur in patients with chronic liver disease presumably due to the changes in the hemodynamics and coagulation profile. Avoidable risk factors like anemia, hypotension, and hypovolemia should be managed promptly in patients with chronic liver disease. These could also be confounding factors in the interferon-, ribavirin-, and tacrolimus-associated visual loss in cases where the drugs were used in the treatment of liver pathology. 1. Hayreh SS. Ischaemic optic neuropathy. Indian J Ophthalmol 2000;48:171-94. 2. Fodor M, Nagy V, Berta A, Tornai I, Pfliegler G. Hepatitis C virus presumably associated bilateral consecutive anterior ischemic optic neuropathy. Eur J Ophthalmol 2008;18:313-5. 3. Sinnreich M, Rosillion B, Landis T, Burkhard PR, Sztajzel R. Bilateral optic ischemic neuropathy related to chronic hepatitis C-associated anticardiolipin antibodies. Eur Neurol 2003;49:243-5. 4. Chan JW. Bilateral non-arteritic ischemic optic neuropathy associated with pegylated interferon for chronic hepatitis C. Eye (Lond) 2007;21:877-8. 5. Yaghi C, Baz P, koussa S, Daniel F, Haddad F, Sayegh R. Ischemic anterior optic neuropathy complicating interferon alpha-2a and ribavirin treatment for acute hepatitis C. Gastroenterol Clin Biol 2005;29:616-7. 6. Gupta R, Singh S, Tang R, Blackwell TA, Schiffman JS. Anterior ischemic optic neuropathy caused by interferon alpha therapy. Am J Med 2002;112:683-4. 7. Kaeser PF, Borruat FX Visual loss after orthopedic procedures. J Arthroplasty 2011;26:338.e17-9. 8. Brazis PW, Spivey JR, Bolling JP, Steers JL. A case of bilateral optic neuropathy in a patient on tacrolimus (FK506) therapy after liver transplantation. Am J Ophthalmol 2000;129:536-8. 9. Romero FJ, Bosch-Morell F, Romero MJ, Jareño EJ, Romero B, Marín N, et al. Lipid peroxidation products and antioxidants in human disease. Oxygen/Nitrogen radicals and cellular injury. Environ Health Perspect 1998;106 Suppl 5:1229-34. 10. Northup PG, Sundaram V, Fallon MB, Reddy KR, Balogun RA, Sanyal AJ, et al. Hypercoagulation and thrombophilia in liver disease. J Thromb Haemost 2008;6:2-9.